Never use a fuse of a higher or lower amperage rating than that specified on the fuse box cover. This could damage the electrical system or cause a fire. 1. Be sure the ignition switch and the headlight switch are turned off. 2. Remove the fuse box cover1 . 3. Remove the fuse with the fuse puller 2 . 4. If the fuse is openA , replace it with a new fuseB . 5. If a new fuse also opens, have the electrical system checked and repaired by a NISSAN dealer. To reduce battery drain, the extended storage fuse switch comes from the factory switched off. Prior to delivery of your vehicle, the switch is pushed in (switched on) and should always remain on. If the extended storage fuse switch is not pushed in (switched on), the meter may display a warning message. See “Extended storage fuse warning message” . If any electrical equipment does not operate, remove the extended storage fuse switch and check for an open fuse. If the extended storage fuse switch malfunctions or if the fuse is open, it is not necessary to replace the switch. In this case, remove the extended storage fuse switch and replace it with a new fuse of the same rating. 1. 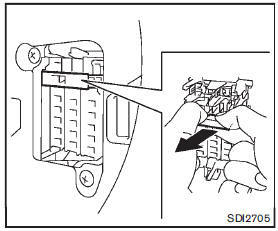 To remove the extended storage fuse switch, be sure the ignition switch is in the OFF or LOCK position. 4. Pinch the storage fuse switch and pull it in the direction illustrated.